"Highly readable--takes the confusion and stress out of treatment." "Provides A Roadmap For The Parent Interested In Biomedical Treatment"
"This Book Should Be In the Possession Of Every Parent of A Child With Autism"
Kurt N. Woeller, D.O., has been a biomedical Autism Specialist since 1998. He is an author of several books on biomedical autism treatment, lecturer, and experienced clinician offering specialized treatment and testing for individuals with Autism. Dr. Woeller serves as a clinical consultant for both BioHealth Diagnostics and Great Plains Laboratory, providing patient and physician education through training programs and monthly webinars. He is also is on the Integrative Medicine for Mental Health (IMMH) Scientific Advisory Panel. He is also the Medical Director for Integrative Medicine Academy. Dr. Woeller lectures throughout the country regarding the benefits of biomedical therapies for Autism. He also runs a variety of patient access websites as part of his extensive educational network including www.AutismRecoverySystem.com which is a parent and physician biomedical autism resource website with direct access to Dr. Woeller for questions and answers regarding biomedical autism treatments. He has a number of other information websites for autism education at www.AutismRecoveryTreatment.com (which is a FREE video blog site) and www.AutismSupplementsCenter.com (which provides video information on various supplements useful for autism intervention) and www.MethylB12forAutism.com , a site dedicated to the positive effects of Methyl B12 for children on the autism-spectrum. Dr. Woeller has been featured on various TV and radio programs including Fox and NBC News in San Diego, the Travel Channel’s “Responsible Health” show, and various radio shows. He is currently a monthly guest on “The Mother Cub Show” on World Talk Radio appearing as a specialist in biomedical autism intervention. As the caregiver or a parent of a child on the autism spectrum, you need real help to recover your child--and your family--from the grips of Autism. 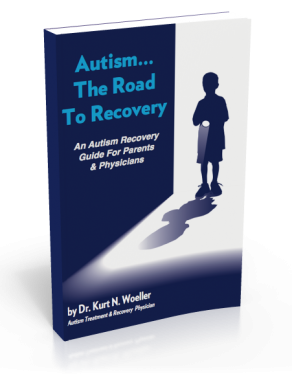 “Autism--The Road to Recovery” is a road map to biomedical autism treatment, written by world renowned autism specialist Dr. Kurt Woeller, who has spent the last 15 years working with families on the autism spectrum with great success. This book helps explain why autism is likely occurring, but more importantly, what you can do about it. You’ll learn how to implement supplements, change your child's diet and track results, use Methyl-B12 therapies, testing options, detoxification procedures and more. Dr. Woeller shares his years of clinical experience, and discusses what he has seen most helpful. he outlines an approach to intervention that he has used with great success. This book is a must for anyone new to the idea of medical intervention for autism, as well as those who has been working for some time with biomedical therapies to help their child. Purchase Your Downloadable Copy Now!